Congratulations to Laura Houston of Eugene, Oregon, the winner of this giveaway! 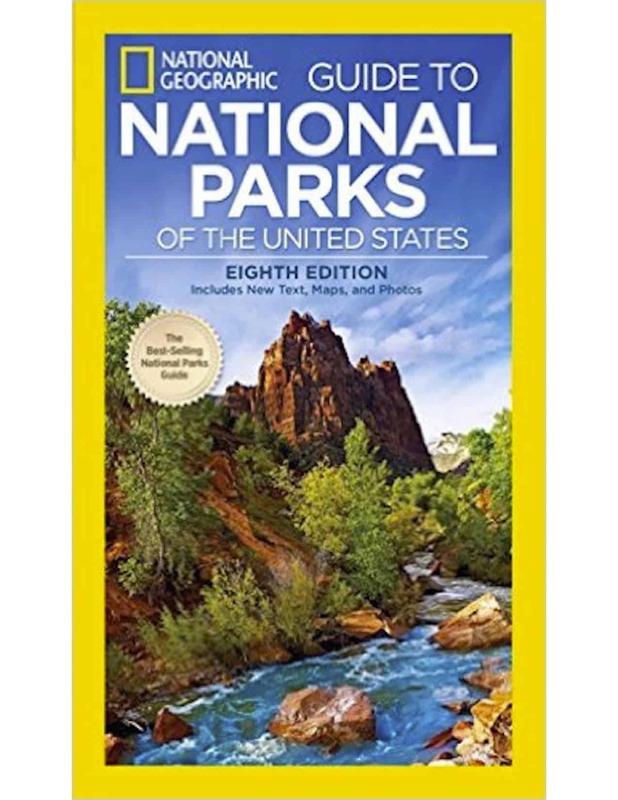 In time for the National Park Service (NPS) 100th anniversary this coming August, National Geographic Books has redesigned and updated its best-selling travel reference guide, National Geographic Guide to National Parks of the United States. Our country’s national parks are a national treasure but so many times, Americans travel around the world to visit UNESCO World Heritage Sites and neglect the ones closer to home. Fourteen of the 59 national parks in the U.S. are have been designated UNESCO World Heritage sites. Since the National Geographic guide was first published in 1989, it has sold more than 1.25 million copies. Now in its eighth edition, expert contributors revisited the content for all 59 parks based on intensive on-the-ground research to identify the best spots for viewing scenery, wildlife, sunsets and more. Along with an historical/cultural overview of each park, the compendium offers information about how to get there, when to go, where to find campgrounds and lodging, and what to see once you get there. The book also includes brand new text, 80 full-color maps and 220 photographs. Organized by region, this new paperback edition will continue to inspire armchair readers as well as those who are planning to visit the parks on vacation. The National Geographic Society was one of the founding patrons of the NPS. In celebration of the anniversary, National Geographic has also created a web portal, Explore the Power of Parks with stories, photos and videos from the magazine. U.S. citizens over the age of 62 are eligible to purchase a lifetime Senior Pass for $20 that includes entry to these parks. In fact, the pass provides access to more than 2000 recreational facilities managed by the National Park Service and four other Federal agencies: the Bureau of Land Management, Bureau of Reclamation, Fish and Wildlife Service, USDA Forest Service, and U.S. Army Corps of Engineers. In addition, the Tennessee Valley Authority may honor the Senior Pass for entrance or camping discounts. Click here for more information about the Senior Pass and how it can be obtained. The publisher has agreed to provide a free copy of this new guide to one lucky reader of More Time To Travel. To enter the giveaway, on or before March 15, 2016, leave a comment below with the name of the U.S. National Park you would most like to visit. One winner will be randomly selected and announced here. I would love to visit Glacier National Park to celebrate my 60th wedding anniversary. Glacier National Park in WA state, with Yellowstone a close second! Ellis Island to see where my grandparents arrived from Russia. I would like to visit Glacier National Park. A few years ago when I rode the Empire Express from St Paul to Portland, the short stop at Glacier National Park intrigued me. I so wanted to get off the train and visit and I said to myself that one day I would be back to do that! I’d love to visit Yosemite! I would most like to visit Yellowstone and see old faithful. Hope that I get to visit Yellowstone this Spring!! I would most like to visit Yellowstone. The next two National Parks I want to visit are Yellowstone and Glacier. I also want to get back to Yosemite as it has been five years since I was last there. Would love to go back to glacier national park, we were out there last year when they had all the fires out there. We could not go through the route we had planned on going because of thefires. Would love to have the chance to go back! I like to visit Yellowstone with Glacier Natinal Park coming in 2nd. Thanks for the chance. Yosemite as I have worked at many of the parks. Would love to visit Yellowstone! I would most like to visit Denali National Park. I would like to visit Arches National Park. I would love to visit Yosemite! I’ve always wanted to visit! I would love to see Glacier National Park. I would like to visit Yellowstone. I really want to go to Yosemite! I want to visit Yosemite National Park. ACADIA NATIONAL PARK looks beautiful! I’d take my wife to Yosemite. National Geographic has always been one of our favorite magazines over the years. And it’s great that mature folk get to visit national parks for almost free :-). Yeah! Would love to visit Channel Islands!!! National Geographics has always been a very important magazine in our home for our children to see and read!It has taught them so many new ways of life and so many places they could go. I would love to be able to take everyone to Yellowstone National Park! Thanks for the opportunity to maybe make this happen! I want to visit Mesa Verde National Park. We’d love to visit Yellowstone! I would love to visit any park in Alaska or Colorado. I’d love to see Yosemite! I would love to take my family to Yellowstone! Burney Falls State Park. Family Tradition. I would like to visit Grand Canyon National Park. I\’d love to see Yellowstone one day. I want to visit Lassen Volcanic national park. I want to go to the Grand Canyon. I would love to visit Denali National Park. Thanks for the chance to win! I’d love to take the kids to Yellowstone. Our family wants to visit Yellowstone!! i want to go to yellowstone national park. i have heard it is amazing. I would love to visit Yosemite again, it was absolutely gorgeous the last time I was there. Yellowstone or the Grand Canyon, both are on my list. The U.S. National Park I would most like to visit is the Great Smoky Mountains. I’d like to visit the Grand Canyon National Park. Grand Canyon would be my National Park of choice. I have always wanted to visit Yellowstone National Park. I would love to visit Yellowstone National Park. The photos have always been so sincere. I’d like to see the Grand Canyon. I want to see Hawai’i Volcanoes park. So many I would love to visit, but especially Yellowstone. I would like to visit Yosemite. Thank you for hosting! I always enjoy Yellowstone but closer is the Badlands so we visit it more. Arches National Park sounds lovely, I would like to visit with my family. Glacier National Park is next on my list. I’d love to visit Yosemite someday. I would love to visit Zion Np for sure. Yellowstone is a must for me! Yellowstone, for me! Is it safe? Zion for me, it looks absolutely incredible! Everglades National Park. Such a huge park so many beautiful things to see. Celebrating National Margarita Day on February 22 - Salud!